Our world is becoming ever more dangerous because of failed nuclear power plants and bunker-busting uranium bombs. Recent examples include the Fukushima disaster in Japan and the use of depleted uranium bombs in the Middle East. The good news is that detoxing for radiation victims is possible through the use of oral chelation formulas, such as Heavy Metal Eliminator offered by Out of the Box Remedies. The idea of using chelation is a relatively new concept that only appeared in 1948. You don’t even need to be near the scene of a nuclear disaster to be affected, either. All of the states around Iraq are affected because of wind currents. Radioactive substances have already made their way along the Pacific ocean to contaminate the west coast beaches of the Americas. Even the UK isles, radiation levels have even increased due to wind currents from the Middle East. Guess what happens when you ingest food that was swimming or grown in a radioactive area? Removing toxic metals from the bloodstream is possible using chelates. Chelates are the compounds formed when amino acids or certain other substances combine with toxic metals. These chelates are then eliminated by the body, mostly via the colon. There are certain substances that have an affinity for heavy metals. The prominent herb is Cilantro, which is also a common spice. When Cilantro is combined with Chlorella, both work synergistically, meaning the two combined work better than either one alone – something like a good marriage. Good dentists recommend Chlorella to their patients who undergo dental amalgam (mercury-silver filling) removal so that their patients do not become overly toxic from the mercury released. As it turns out, Cilantro is also good at attaching itself to mercury, thus allowing its elimination. Out of the Box Remedies offers a convenient tincture that contains both Cilantro and Chlorella called Heavy Metal Eliminator. When chelating the body, it is important to keep magnesium levels sufficiently high. According to Doctor Boyd Haley: “A sufficient magnesium level not only leads to safer detoxification and Chelation, it makes chelation possible.” This is because the chelating process does not distinguish between “good” metals and “bad” metals. Thus, it is best to first take a chelator, say a Cilantro-Chlorella combination, and a few hours later supplement with those metals (minerals needed by the body, such as those listed in the table below). This way you are always supplying your body with needed minerals and yet getting rid of the bad ones – see below. In the “bad guys” column, any amount is bad, save for small amounts of Chlorine – most are cumulative poisons. Chlorine is needed to produce stomach acid for digesting food in the form of hydrochloric acid. There are even more “bad guys” than those shown in the table – only the more common offenders are shown. The radioactive ones are notorious for shortening lifespans. 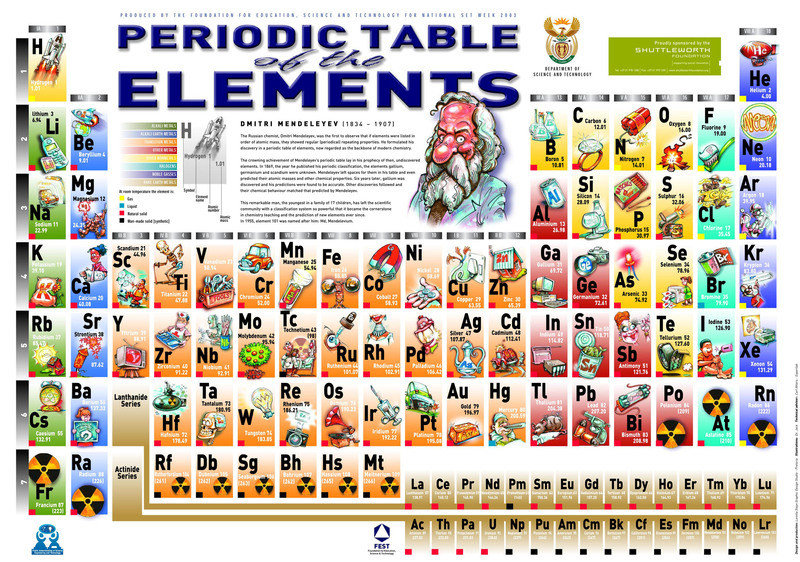 Iodine (I), a halogen, is known to displace other halogens – see the aqua colored column in the periodic table of the elements shown above and shown to the left of this text. The other halogens in question, all of them deleterious to health, include Fluorine (F), Chlorine (Cl), and Bromine (Br). These undesirable elements can then be more easily chelated by the likes of Heavy Metal Eliminator (a Cilantro and Chlorella combination). Happily, iodine has even been shown to displace mercury, a big bonus for those unfortunate enough to be carrying mercury-silver fillings in their mouths. Caution: Iodine must be purchased in a form that can be taken internally; drugstore iodine is for EXTERNAL USE ONLY (because it contains isopropyl alcohol). The suggested form for INTERNAL USE is in the formulation invented by Professor Lugol in the 1800s, namely elemental iodine combined with potassium iodide in a distilled water base. This formula is known as Lugol’s Iodine. Out of the Box Remedies uses the Lugol’s Iodine formulation in the product called Hormone Catalyst. For those unlucky enough to be affected by the Fukushima disaster, iodine serves the additional function of displacing radioactive iodine that might already have been ingested. If the thyroid gland is saturated with non-radioactive iodine, such as that contained in Hormone Catalyst, then radioactive iodine cannot stay in the body and it will be eliminated via normal body functions. Taking 50 mg/day of Hormone Catalyst is recommended for adult Fukushina radiation victims. If I lived near Fukushima, I would definitely invest in a radiation detector as well. This entry was posted in Health and tagged chelation, chlorella, cilantro, Depleted uranium, Fukushima, Fukushima Daiichi nuclear disaster, Fukushima disaster, Heavy metal (chemistry), Heavy Metal Eliminator, Hormone Catalyst, Japan, Lugol, Lugol's iodine, Lugols, Middle East, Periodic table. Bookmark the permalink.